Since I last posted here, my little boy's first day at school has come and gone. That day filled me with delight and pride for the little 'big' boy that he has become but also with tears and nostalgia for the little 'baby' boy he no longer is. On his first day, he got into his uniform reluctantly and held both our hands tightly as he entered the classroom with trepidation. He joined in with the other children at a round table adorned with crayons and playthings. Although he looked happy enough, it was such a wrench to leave him, that even my normally controlled husband had a tear in his eye! We need not have worried ourselves in the least about him. After his first day, he was bursting with excitement and really happy that one of his best friends and a few from his preschool were in his class.When I took him to visit his Granny in his uniform, he was so proud of himself and so exuberant about it all. I couldn't help but think back to my own first day, many moons ago (approximately 42!) and let me say, it was very very different. I didn't like the shirt and tie, the green checked duffle coat and the heavy schoolbag. I was terrified to be thrust into this noisy, crowded unfamiliar room with a bunch of strangers. I wailed loudly when my mother left me. I still remember sitting at my individual wooden desk with the inkwell and measurements on it,( inherited from the dark ages it seemed) and feeling so desolate and confused. To make matters even stranger, many of the teachers and staff were nuns and in those days, wore full regalia! Nowadays, the children are seated in a circle together, given crayons and things to play with and gently introduced to their new world. Most children have had some experience of preschool too, so it makes for an easier transition all round. In my day, nobody but the privileged few had done this. Now that Halloween is nearly upon us, the nightly sounds of bangers and fireworks going off is becoming a familiar sound. I can't say that it is a time of year that I particularly enjoy, mainly for the reason that it's a scary time for the animals. However, it is an exciting time for the children so I am begrudgingly throwing myself into things for the sake of my five year old son. He dressed up as a ghost last year and as he has an imaginary friend in Casper the Ghost, this was very apt. 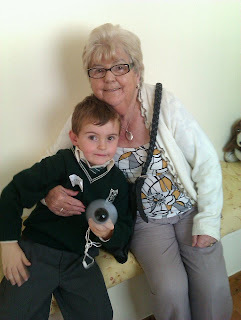 This year he is obsessed with Spiderman and will probably wear the costume his Granny Joan (my mother) got him. We will go to a Halloween party on Monday and then he will go to visit his cousins for trick or treating on Halloween itself. When I was an child, we didn't have fancy shop bought costumes but made our own out of black binliners and old sheets and blankets. I used to wear a wig of my mothers that had survived from the sixties and I looked forward to wearing it each year. We then went around a few friends and neighbours in disguise chanting our mantra 'help the halloween party'. As far as I know this was something we said here in Ireland when they were saying 'trick or treat' in other places. It was a phrase that guilted your neighbours into giving you lots of treats although the treats back then were much healthier. We mainly received apples, oranges, bananas, coconuts and peanuts where nowadays they seem to get a lot of sugary things! I would love to hear some of your memories of your first day at school and your childhood Halloween rituals so feel free to share! Aww your little man looks so cute in his uniform! I can still remember my first day too, hiding behind my mother's back!! I hated it for weeks:( Hope you have a great weekend! I think school is so much more pleasant nowadays. When I drop my little man off, I want to stay there myself!! School - I went to kindergarten, where I was very shy. Then I went to St. Mary's for 1st through 5th grades, where I blossomed. Only 1 nun teacher for me during those 5 years. I have enjoyed reading about your little guy's entrance into the big boy world; and seeing the photos. I'll bet he loves his granny as much as she loves him. Thanks for the welcome back Anita. It has been a while! Its a credit to you that your boy made the leap into school life so well. Well done. My boy has been at school for 5 years and it just feel strange. I still think he is in primary one. Halloween in 1970s Scotland did not involve trick or treating. We call it 'Guising'. "Money for the Guisers" in your mum or dads old clothes. Not sure where it originates from. Lasting memory is of my brother being violently ill each year. Now we realise he had a nut allergy. The whole of kindergarten is very foggy but I distinctly remember the moment when I realized that I was all alone in a room full of people I did not know. My teacher, Mrs. Mularchey, was doing a sock puppet show, that is very clear. And so, when my girls went off to kindergarten four years ago, I was a complete wreck, a mad crying woman on the playground. They loved it, we all survived, and now, so difficult to believe, they are in third grade. I still miss them everyday! Thats the thing, we mothers get emotional and the kids are actually fine. Especially nowadays when they have had experience of preschool or playgroups. Your post brings back memories of my daughters' first day in "real" school. I did feel better that first daughter was with the second one at school. I can't believe how your son has grown. Love the picture of him with his granny! Thanks Cynthia. Love that photo too. I'm late to this 'party'. It makes me laugh to think you 'guilted' out the neighbors to give you Halloween candy. We are great at the 'guilt' thing here in Ireland! If you get online and browse through all those Ukrainian online dating web sites with the photos of gorgeous Ukrainian brides, no doubt you would get a desire to start dating one of them (if not all)! However, even though these beautiful looking young Ukrainian ladies seem to be so available and willing to date any foreign men, in reality there is a rather severe competition between men who seek to win their hearts.